The Cuomo administration today outlined the third component of Governor Cuomo’s “2015 State of Opportunity Agenda” – a $1 billion broadband program that leverages both public and private resources to ensure every New Yorker has access to high-speed internet by 2019. This represents the largest and boldest state investment in universal broadband deployment in the country. Matching private-sector investments. Broadband providers seeking to utilize this funding must provide at least a 1:1 financial match, which will push the size of the program above $1 billion. The State’s investment will serve to stimulate competition in the broadband market where none or little exists; improving affordability and quality of service. Unprecedented broadband speed. Broadband providers must provide internet speeds of at least 100 Mbps, with funding priority given to those delivering the highest speeds at the lowest cost. In certain limited cases, providers may offer 25 Mbps speeds to the most remote unserved and underserved areas of the state (more than three times the current standard) scalable to 100 Mbps or more - if this provides the best means of achieving universal broadband access to the region. Local input to guide development. Building on the successful Connect NY model, each Regional Economic Development Council (REDC) will submit a comprehensive plan to the State that: 1) identifies unserved and underserved areas; 2) aggregates demand across residential, institutional and business sectors; 3) details the most cost-effective means to provide universal access; and 4) leverages state-owned assets where possible. 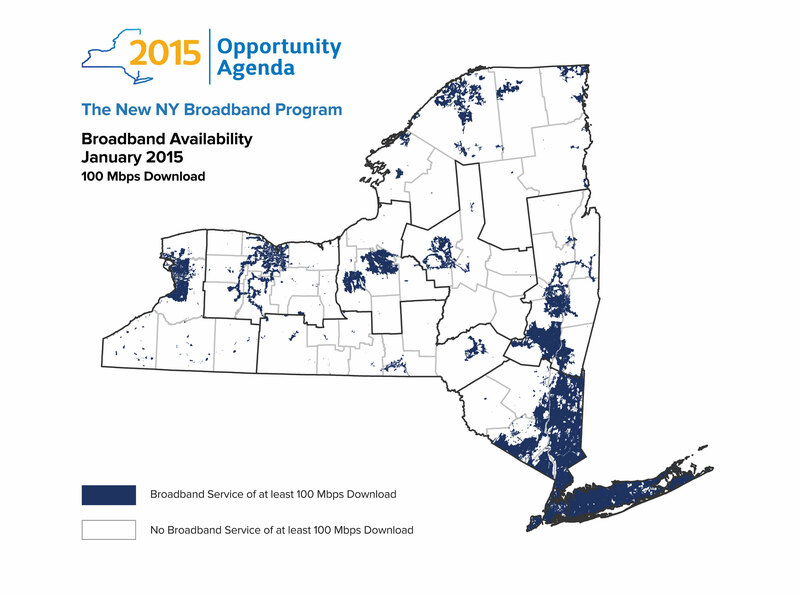 Broadband has never been more critical to New York’s future. Broadband is responsible for 20 percent of new jobs across all businesses, and 30 percent of new jobs in businesses with fewer than 20 employees. Farmers need broadband to manage their crops, rural doctors need it to read x-rays and scans in real-time, and students need it for online and digital learning. One million New Yorkers and 4,000 businesses cannot get access to broadband at the State’s previously established minimum speed standards (6 Mbps download and 1.5 Mbps upload) – speeds that are already too slow. To understand just how slow six Mbps is: it takes approximately 1.22 hours to download a 6 gigabyte movie at that speed. The same movie would only take 49 seconds to download at 100 Mbps. 5.4 million New Yorkers and 55,000 businesses cannot get access to broadband at 25 Mbps. 7 million New Yorkers and 113,000 businesses cannot get access to broadband at 100 Mbps - the minimum speed a 2014 survey of economic developers said was needed to attract and grow businesses. This includes 70 percent of Upstate New Yorkers. More than 2,000 of New York’s public schools report speeds lower than 100 Mbps. And nearly 500 public schools have no broadband service at all. A regional breakdown of current broadband access speeds is available here, and a visual representation of communities that currently lack 100 Mbps broadband access can be viewed here. Access to high-speed internet is critical to ensuring that all New Yorkers can reach their full potential in today’s technology-driven world. To complement the work of the New NY Broadband Program, the Governor’s administration will also explore ways to streamline permitting and processes, embrace dig-once and make-ready policies, and institute uniform state agency procedures that encourage broadband deployment to further support these broadband speed and deployment goals. The State will also explore innovative ways to leverage its own assets, including the more than 500 miles of fiber that runs along the New York State Thruway. The launch of the New NY Broadband Program builds on the work already in progress to expand broadband access and adoption throughout New York State. Governor Cuomo has already awarded over $70M to expand high-speed Internet access in rural upstate and underserved urban areas of New York through the Connect NY Broadband Grant Program and additional economic development funds. The New NY Broadband Program complements the Governor’s Smart Schools Bond Act which voters passed in November 2014 and provides $2 billion to school districts to upgrade technology in the classrooms and to ensure all New York schools are equipped with robust, affordable broadband networks, among other uses.